An Israeli court accused Israeli intelligence services of arresting Palestinians over false accusations and press them to give false confessions. 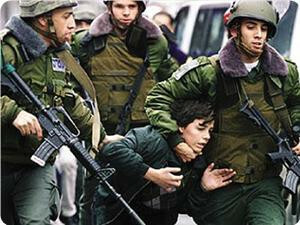 Israeli occupation forces abducted 6,500 Palestinians in 2017, including 1,600 children, 170 women and 185 patients, Palestinian Prisoners Club (PPC) said on Monday. 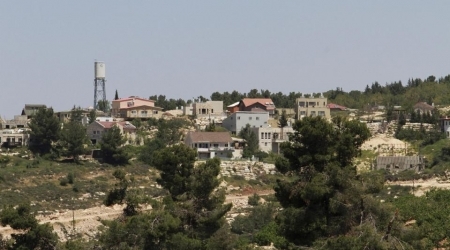 In a report, the PPC said that the Israeli occupation abducted 4,382 Palestinians from the occupied West Bank, including 1,400 from Al-Khalil alone. The report noted that the Israeli occupation forces abducted 2,000 Palestinian from the occupied Jerusalem and 118 from the Gaza Strip. Among the Palestinian abducted, the PPC said, there were 13 Palestinian parliamentarians and 14 academics, including professors with international reputations. In addition, the PPC said that the Israeli occupation authorities issued 1,086 administrative detention orders –form of illegal detention where the detainee is not entitled to know the reason for his imprisonment. The PPC also said that 1,500 among them were former prisoners, tens of them spent decades inside the Israeli prisons. Meanwhile, an Israeli court accused last month the Israeli security services of arresting Palestinians over false accusations and press them to give false confessions. On October 1, 2009, Amendment No. 109 of the Security Provisions Order went into effect, establishing a military juvenile court, as part of the military courts where Palestinian residents of the West Bank are prosecuted. The establishment of the military juvenile court was presented as a revolution as far as the prosecution of minors is concerned, and as a significant and material improvement in protecting their rights. The age of the defendants: the boys judged in the military juvenile court during our observations were 13-18 years old at the time the alleged offenses were committed. The biggest group of minors was 15 but the court also tried boys as young as 13-14 and as old as 17-18, even though the law that applies to the territories defines minors only as youngsters up to the age of 16. It appears that the military juvenile court is inclined towards “leniency” in this matter and also tries boys ages 16-18, albeit not systematically. The most common offenses were throwing objects: stones and Molotov Cocktails. In most cases the objects were not actually thrown, or did not hit their target and did not cause any damage. In no case did they cause severe harm. Detention and release on bail: detention does not serve as a last resort for the shortest time possible, but is used in most cases. Only about 6% of the defendants were released on bail whereas the rest were detained until the end of the proceedings against them. Punishments in many cases coincide with the days served in detention, and the frequent use of detention undermines the presumption of innocence. The length of the legal proceedings: indictments were served promptly. 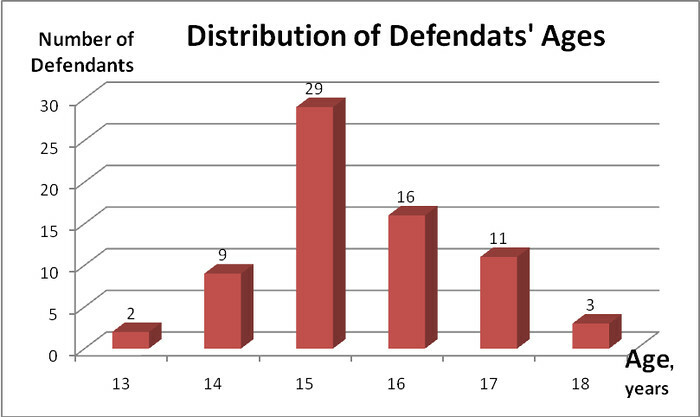 In 79% of the cases an indictment was served within a week or two of the detention. Nor are the legal proceedings relatively long. In 47% of the cases the legal proceedings were concluded within three months and in another 35% they were concluded within six months. However, one must remember the relatively light and simple charges and the fact that the absolute majority of cases end with plea bargains without hearing witnesses. Representation by a lawyer: all the boys were represented by lawyers. In two cases when the boys came to court unrepresented, the court appointed lawyers to represent them. Participation of parents in the proceedings: was observed in only a few cases. The court does not inform the parents of their right to participate in the proceedings as it should do. Welfare officer reports: in only 4% of cases were welfare officer reports used, and then only in particularly grave cases. Confessions and incriminations: the vast majority of files were based on the defendants' confessions, given during police interrogations, and on incrimination by boys of similar ages given in the same circumstances. In no case was there a trial within a trial on the admissibility of the confessions, even though in some of the cases serious and similar allegations were raised about the interrogation: night arrests and night interrogations, beatings, threats and extreme violations of the suspects' right to consult lawyers and to remain silent. In no case did the court take any measures concerning such allegations brought before it. Convictions and plea bargains: 100% of the cases ended in convictions. The vast majority of the legal proceedings (98%) ended with plea bargains between the prosecution and the boys' defense lawyers, except two cases, no testimony by witnesses was heard at all. The court accepted the plea bargains in 100% of cases and issued sentences based on the agreement between the prosecution and the defense. In half the cases there was a substantial reduction of the charges, in the vast majority without hearing witnesses. Such a vast reduction of charges without any change in the evidential material raises questions as to the military prosecution's discretion in serving the indictment. This practice raises the possibility that charges are included in the indictment a priori as bargaining chips. Since the vast majority of legal proceedings end with plea bargains that the court respects, and all end in prison sentences, it seems that the role of the military juvenile court in sentencing boys who are arrested and tried is rather negligible. Punishment: in 98% of the cases a prison sentence is imposed, and in 100% of the cases a suspended prison sentence is imposed. In 96% of the cases a fine is imposed in addition to a prison term, and the court sentences the defendant to additional days in prison if the fine is not paid. Imprisonment is a default punishment imposed as a first rather then a last resort. Despite the criticism of the judge in Ofer Military Juvenile Court, Maj. Rivlin-Achai, of the absence of alternatives to imprisonment, she did not choose to refrain from prison sentence but in a single case when the defendant was already released. She paid lip service to the need to change the legislation. However, there is no rule requiring the court to impose prison terms and there was cause in many cases not to impose prison terms. In such cases, suspended prison terms or fines, with an emphasis on deterrence for the future, would have sufficed. Fines were imposed almost always in addition to the prison punishment. It is not at all clear what justification there is to impose a fine in addition to prison, as well as sentencing days in prison in exchange, even though payment depends only on the parents' economic ability. In many cases there was no appropriate proportionality between the severity of the offense and the punishment, and long prison terms were imposed. Non proportionality stems also from the extensive use of fines and imprisonment in exchange. The findings show that the establishment of the military juvenile court brought about only a marginal change in the legal proceedings against Palestinian minors in the West Bank. The amendment of military law that led to the establishment of the military juvenile court had no effect at all on the interrogation and arrest procedures, which are the de facto critical stages that dictate the outcome of the whole legal process. The widespread use of detention undermines the presumption of innocence and, in the vast majority of cases, dictates conviction and punishment by imprisonment. The role of the court begins only after those stages and is in fact almost negligible considering the common practice of plea bargains, their acceptance by the court and the automatic sentencing of long prison terms. Amendment No. 109 of the Order Regarding Security Provisions came into effect on 1 October 2009 (Appendix A).This amendment to the primary criminal law used by the IDF in the West Bank, ordered the establishment of a military juvenile court within the military courts in which West Bank Palestinians are prosecuted. The establishment of a military juvenile court was presented as a revolution in adjudication of minors, and a significant, substantial improvement in maintaining their rights. Volunteers from No Legal Frontiers observed the legal proceedings at the Military Juvenile Court in Offer Military Base, to examine whether establishment of the Military Juvenile Court had an effect on the trial of Palestinian minors and in maintaining their rights. From April 2010 to March 2011, the volunteers observed the proceedings heard before Military Judge Major Sharon Rivlin-Ahai, who was trained as a juvenile court judge. The volunteers kept track of the proceedings, discussions between the judge, prosecutor, and defence attorney, whether parents or other family members attended the hearings and if they succeeded in making contact with their children standing trial. The volunteers observed hundreds of legal proceedings of minors, but documented and gathered material in a systematic and orderly fashion through all stages for 71 cases that were completed during the period of observations. 70 proceedings were completed during the period of observation. The indictments, transcripts, and court decisions were collected from all the entire proceeding. Other material recorded during the observation of the trials was added to the official material, including additional clarifications received from defendants’ relatives and lawyers. Since the observations and material gathering took place in the Military Juvenile Court, the focus was on the trial itself, starting from submission of the indictment until the trial verdict. The materiel does not relate to initial detention, interrogation, remand, or appeal proceedings. Data pertaining to detention conditions, the juveniles’ connection with their families outside the court, and other matters connected to detention and arrest were also not collected. However, as can be seen from the observers’ reports, the detention and interrogation stages are mentioned in the Military Juvenile Court during the trial, and when the verdict is given. These stages are also described in the words of the juveniles’ families, and selected segments of these comments appear in Appendix B to this report. This report examines to what extent the main provisions relating to the Military Juvenile Court have actually been applied. Moreover, it specifies the standards set by international law regarding management of criminal proceedings of minors. Most of these standards are applied in the juvenile courts within Israel, according to the Israeli Youth Law that determines how criminal proceedings for juveniles should be conducted. We will use these same criteria to examine criminal proceedings for Palestinian minors in the military courts. Israel operates a military court system in the West Bank that is responsible for judging both adult and minor Palestinians detained by the Israeli Army, and prosecuted by the military prosecution. The military courts in the West Bank were established just a few days after Israel took over the territory from Jordan in 1967. They serve today as one of Israel’s main mechanisms in controlling the Palestinian population. Since 1967 between 650,000 and 700,000 Palestinians were detained by the Israeli Army in the West Bank. Some 700 minors, under the age of 18, are detained and brought before these courts every year. The courts operate based on military proclamations and orders, which have the status of laws in the occupied territories (hereinafter: Military Legislation), and define the legal foundation of the military regime. Military legislation has determined that the Commanding Officer ( O.C.Central Command) is commander of the West Bank (called "the Region”) who holds all governmental authorities, including the right to promulgate legislation. The Military Legislation defines which acts are considered offences against security, and designates the military courts to enforce this legislation. no separation of powers exist within the military regime and thus the army is at the same time the legislature, the judiciary and the executive. These fundamental flaws are irreparable as long as the occupation persists. Nonetheless it remains highly important to maintain the rights available to people under occupation to the maximum extent possible. The Order Regarding Security Provisions [Consolidated Version] (Judea and Samaria) (No.1651) – 2009 is the main military order serving as the criminal law of the military legal system. It defines offences and penalties, and the rules of Criminal Procedure and Evidence. Since the Order’s original enactment in 1970,  it was amended more than 120 times, and put into effect in its current version in 2010, incorporating the previous amendments, and 20 other orders dealing with criminal offences. Young Adults - over 14 but not yet 16 years old. Anyone over 16 years old, was no longer considered a minor, and was judged as an adult in every respect. The order determined that Children will not be prosecuted at all, and Youths and Young Adults shall be detained apart from adult detainees, unless the Military Commander orders otherwise in a specific case or type of cases. In addition, according to the Order Youths at the time of sentencing may not be sentenced to more than six months in prison. Young Adults may not be sentenced to more than one year in prison, except for offences that warrant a sentence of over five years, in which case the maximum sentence may be imposed without any limitations. The sentence may impose on the minor’s parents a fine, or payment of a guarantee not to commit additional offences, as well as imprisonment in the event of nonpayment. Central provisions of the Order Regarding Judgment of Juvenile Offenders were dramatically different from Israeli law pertaining to minors. Some main differences are that the Israeli legal system considers young people as minors until the age of 18. By contrast, according to the Order Palestinian youths reach their majority at the age of 16; there was no difference between trying adults and minors, and no provisions were made for a Juvenile Court. The Order did not provide any alternatives to actual imprisonment, and no social services accompanied the legal proceedings. There were certain restrictions on sentencing, but these were quite limited since for most offences in the Security Provisions Order the sentence is predetermined to be five years or longer. In these instances, it is also possible to sentence minors to the maximum penalty, including life imprisonment and death sentences. a. Establishment of a Military Juvenile Court in which judges who have received special training will try cases of minors under 16. Detention and release proceedings of minors will still be heard in regular military courts and not in Military Juvenile Court. b. As a rule, a minor shall not stand trial together with an adult, except by approval of the military Judge Advocate General or someone authorized by him. c. The Military Juvenile Court will make every effort to hold its hearings in a different place or at a different time from trials of adults. As far as possible, minors shall not be brought into court or held there together with adults. d. A person should not be tried for an offence committed as a minor if two years have passed since the time of the offence, unless the Chief Military Prosecutor, or person authorized by him so approves. e. An indictment against a minor shall state his date of birth inasmuch as this may be verified. f. The Military Juvenile Court may appoint a defence attorney for the minor. g. The minor’s parents will have legal status in the court and will be entitled to make requests, examine witnesses, plead and make claims on his behalf. h. For the purpose of determining the sentence, the court may order a report from the social welfare staff officer in the Civil Administration that will detail the personal circumstances of the minor and his family and offer recommendations regarding the prospects of the minor mending his ways. i. Detained minors must be held in a special detention facility for minors or in a separate section of a general detention facility. The establishment of the Military Juvenile Court and amendment of the Order Regarding Security Provisions improved the military legislation regarding court proceedings of minors. The separation of minors' trials from adults; granting parents legal status in proceedings against their children; the court's authority to appoint a defence attorney; and a mechanism to obtain a report from the social welfare staff officer in the Civil Administration, giving the court social information about the minor, are all substantial improvements. Nevertheless, as we shall demonstrate, key parts of the law,violating minors' rights remained in place, and the most essential rights of minors are still being violated. The guiding principle in relation to any legal action regarding minors should be the child's best interest. International law as well as Israeli law recognizes that children and teens differ from adults in their physical and psychological maturity and in their emotional and educational needs. They are regarded as less responsible for their actions than adults because their judgment is not as well formed and is more influenced by environmental factors. In addition, since their behavior patterns are still in process of consolidation, it is easier to influence their development and rehabilitate them, as well as easier to cause them severe damage and harm their development. These, and other differences between children and adults, justify the existence of a separate juvenile judicial system. a. Age of majority is 18 years, depending on local law. b. The best interest of the child will be the main consideration in any proceeding relating to minors. c. Minors under 18 should not be sentenced to life imprisonment or to the death penalty. d. Detention or imprisonment of a minor should be used as a last resort and for the shortest time possible. e. Minors shall be detained separately from adults and should be allowed to maintain contact with their family through correspondence and visits. f. Minors should be allowed access to legal assistance as soon as possible and they should be allowed to contact the Judicial Authority regarding their arrest. Decisions about their detention should be given as quickly as possible. g. Treatment of minors accused in criminal proceedings will be adjusted to their age and their needs and advance their rehabilitation and integration into society as far as possible. Countries shall develop special procedures as alternatives to legal proceedings for minors. Educational and therapeutic programs will be adapted for the benefit of minors and to their circumstances. h. The minor’s parents or other assistance should be included in the procedure if required. In addition, minors as well as adults have, inter alia, the right to be considered innocent until proven guilty, not to be obliged to confess to a crime or admit their guilt (the right against self-incrimination), to exclude any confession given under torture or ill treatment, and to have their trial concluded as quickly as possible. In many respects, rights granted to minors under Israeli law are preferable as compared to those granted minors in the Military Juvenile Court. In Israeli law, anyone under the age of 18 is a minor. Juvenile courts in Israel were first established 1971, when the Youth Law (Adjudication, Punishment and Modes of Treatment) – 1971 was enacted. The Juvenile Courts in Israel are assisted by a comprehensive system of diagnostic, rehabilitation and social services, including probation officers for juveniles, welfare and social workers, open and closed residences that serve as an alternative to actual prison sentences. In the past few years, a number of programs have also been designed to promote diversion of juvenile cases away from the courts to mediation and rehabilitation procedures. B. Minors may not be interrogated at night: minors under the age of 14 may not be interrogated between 20:00 and 07:00, minors over 14 may not be interrogated between 22:00 and 0.7:00. D. The minor’s defence attorney or the Public Defender must be notified before the interrogation begins. E. The interrogation must be conducted in the minor’s language and must be documented from start to finish using audiovisual methods, except in the case of security offences. F. Only youth judges will extend the detention of minors and hear their case. G. A minor under the age 14 must be brought before a judge within 12 hours. In special cases, a Senior Police Officer may extend this time limit to 24 hours. Like adults, minors over the age of 14 must be brought before a judge within 24 hours. H. In the case of security offences, an officer so appointed may decide to delay up to 48 hours before bringing a detainee to a judge. More senior officials may delay by 96 hours (4 days). In view of the provisions in the Youth Law, it is not clear whether these provisions also apply to minors. J. A minor under 14 should not be detained until completion of proceedings. K. In any case where a request is made to detain a minor until completion of the proceeding, the Probation Service must submit a detention report that examines the detention’s influence on the minor and suggests alternatives to detention. L. The court may conclude that the minor has committed an offence, but not convict him to avoid a criminal record and its accompanying stigma. M. In the event that a minor is convicted or a determination is made that he committed an offence, a report must be submitted by a juvenile probation officer, prior to sentencing. N. The court is authorized to order a variety of a means of non-prison treatment, including monitoring by a probation officer, an undertaking by the minor or his parents that he will refrain from committing offences or assignment to an open or closed residence. O. A prison sentence shall not be imposed on a minor under 14. It is not mandatory to impose mandatory sentences on minors, who have committed offences that carry mandatory life imprisonment, mandatory imprisonment or a minimum penalty. Minors may not be sentenced to death. a. Majority age has remained 16.
b. Detention hearings for minors continue to be held in regular military courts, according to the same provisions of the law by which adults are detained. They are not brought before a juvenile judge, and there is no separation between the detention hearings of the minors and those of the adults. Thus, minors may also be held in detention for 8 days before making their first appearance before a judge. c. Arrests and fines are still the only means of punishment. No alternatives to sentences of imprisonment have been added, and no new provisions have been determined regarding the use of actual prison sentences. d. No new limitations have been put in place in terms of sentencing minors, so that for sentences of over 5 years it is still possible to sentence any minor over the age of 14 to the maximum penalty in force for adults, including life imprisonment and the death penalty. Minors can still expect to be sentenced to long prison sentences. 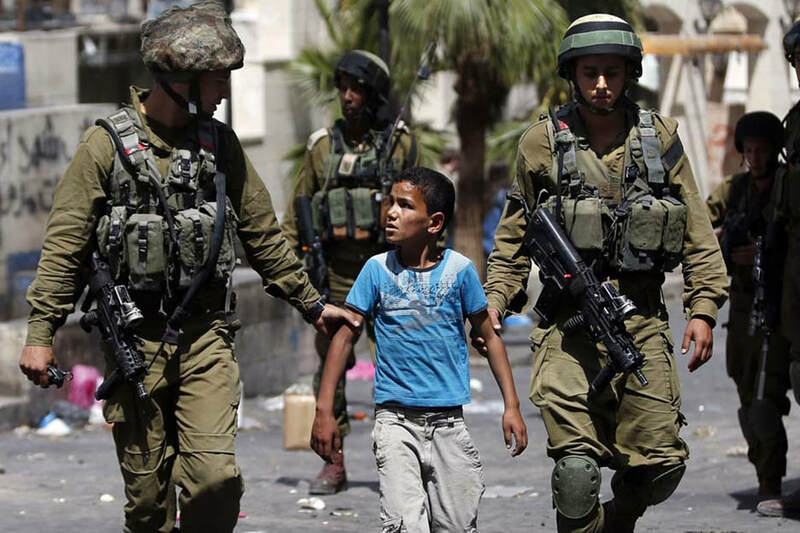 It is therefore clear then, that military law is far from defending the rights of Palestinian minors as required by international law and the Israeli legislation protecting the rights of minors. The large difference between the two legal systems indicates both a double standard and violation of the rights of Palestinian minors. It particularly evidences systematic discrimination, since Israeli law was applied to all Israeli citizens living in the Occupied Territories, i.e., the settlers. Consequently, an Israeli boy from a settlement and a Palestinian boy from the adjacent village would be treated totally differently for the very same offence: in the same territory and addressed by the same authorities, they will follow completely different enforcement routes, determined by their national identity. "Notwithstanding that the provisions of Amendment 14 of the Youth Law do not apply in the Region, we cannot ignore their spirit and the principles that are fundamental about protecting the rights of a minor, even if he is suspected of committing crimes, and giving a heavy weight to the dominant principle of the best interest of the child, as stated in the bill. Ultimately, a minor is a minor is a minor, whether he lives in a place where Israeli law applies to him in full, or whether he lives somewhere else where, although Israeli law does not apply to him fully, he is still subject to the effective influence of the Israeli legal system. The analysis presented so far refers to the law, not to the situation in fact. Our observations in the Military Juvenile Court and the monitoring of juvenile case records attest to the real world; showing how the actual procedure functions in relation to Palestinian minors. Despite the above statement by the President of the military legal system, the tracking results presented below show that the interrogations and the judicial proceedings in Military Juvenile Court do not reflect the spirit of the Youth Law in Israel: in many cases, they stand in clear contrast to it. The findings of the observations at the Military Juvenile Court are presented in a manner that provides the general characteristics of the procedures and of the accused, and then follows important stages in the criminal proceeding. The execution of the military law with respect to adjudication of Palestinian minors, realization of their rights in criminal proceedings and the unique characteristics of the Military Juvenile Court will be examined throughout the report. Approaching the Ofer Military Court from Highway 443 we are welcomed by thistles and piles of garbage, iron and barbed wire fences, naked concrete walls and iron gates. We are here on one side of the fence and right next to us on its other side are the Palestinians who have also come to the court. It has no glory or splendor, only squalor through and through. Orders of "irja la-wara" (go back) and "ta'al" (come) issue from a jarring microphone ordering the crowd to move closer or farther from the entry gate - one of the three that have to be crossed, with metal detectors in between. It is directly followed by a black glass window where you are seen but cannot see who is talking to you. After you hand over your identity card and all of the papers permitting your entry are recognized, the first electric turnstile is released and you are standing in front of a blue iron door with a jail window that opens and closes. Very quickly you understand that if you annoy the guards your entrance will be delayed or prevented and you try to minimize your presence as much as possible. The door opens and we enter one by one, wahad wahad just like the Palestinians, for another metal detector inspection, to screen those few objects we were allowed to bring in (shoes, a notebook and a pen) through a second electric turnstile, and after a reunion with our shoes -- a thorough body search with a handheld metal detector as well as manual palpitation, sometimes of private body parts if the need arises. What do the Palestinian women coming to court go through, we wonder? Are their searches stricter and their feelings of helplessness and humiliation deeper? And what does any of this have to do with the court and the pursuit of justice? Harder than the feeling of smallness during the wait is the look. It says it all, the look of the Palestinians waiting longer than us. Suspense, sadness, despair and complete helplessness. At Offer Camp nobody smiles. The Palestinians who enter its gates, some of them to be judged by judges on behalf of the sovereign, most to catch a glimpse of their relatives jailed in Israeli prisons, sometimes after long and difficult periods in which they did not know what became of them, obliterated entities of no account. Despite their legal rights, few will have a say in court. The vast majority will accept the situation with resignation and fatalism, just hoping it all ends as soon as possible. All of the buildings serving the court are caravans standing in air on blocks. For 44 years Israel has been judging in military courts people who are not its citizens and minors who are not its children, and to the outside observer it all looks temporary and hovering in a world of its own, two hours and it will all disappear into oblivion. And in the military juvenile courtroom the relatives' gaze turns into tears. In many cases the tears are held back so as not to discourage the child. In others they rush forth in a torrent of words of encouragement and longing. In the legal process the end is foretold. There are no expectations and no hope of anything else. As if by conveyor belt, the minors, ages 13, 14, 15 and 16, are brought in groups of three or four, handcuffed to each other with their feet bound together. The handcuffs are taken off during the trial to be re-fastened at its conclusion. In Courtroom Number 2 of the Honorable Juvenile Judge Lt.-Col. Sharon Rivlin-Achai, everything goes peacefully. The atmosphere is calm and relaxed and sometimes even humorous. The judge is pleasant and very patient with the dramatic situations unfolding in her court. Friendly back slaps between the military prosecutors, who are very harsh with the defendants, and the Palestinian lawyers. For a moment you could think you have come to a bastion of enlightenment. But soon enough the observer is confronted with a harsh and cruel reality. The presence of parents may be needed to meet the requirements of the law, but the strict Prison Service guards send them as far as possible from their children, to sit with their backs to the wall, sometimes treating them sharply and rudely. There will be no hugs or kisses or even handshakes. "It is not a visit" they will explain, while the judge suggests we write a letter of complaint to the Prison Service. Only two family members are allowed to be present in the courtroom: if a brother comes, the father will forfeit his entrance. Few parents will ask to speak up in the hope of somewhat mitigating the sentence. Thus, while the trial is conducted, the families will use the brief and precious moments to have some words with their son, to ask if he is cold or hot, if he is receiving medical care and food. In this bizarre place you understand very quickly that it is not the wheels of justice that are turning but the plea bargain. By cut and paste, the minors come in and out already knowing, and if they don't know they will learn very quickly, that to get a ticket out of jail and go back to their previous lives they must confess, as part of a plea bargain, to some sort of amended indictment, even if they claim not to have committed any crime and their only fault is that they were incriminated by others. According to the law, the age of the minors who are supposed to be brought before the Military Juvenile Court) should be between12-15 at the time of committing the offence. Of the 71 defendants whose data was collected, the biggest group (28) was 15 at the time of the offence and a considerable number of boys were younger: nine were 14 and two were 13. There was only one girl among the defendants and the rest were boys. As the data illustrates, boys aged 16 and over were also brought to the Military Juvenile Court, even though according to military law they are not considered minors. The explanation is in an independent policy of the military courts, not enshrined in legislation, to prosecute boys up to the age of 18 in the military juvenile courts. The decline in the number of boys aged 16-17 compared to 15-year-olds might indicate that not all boys that age are prosecuted in the court, as has also been found in random observations in regular military courts. Since we did not monitor hearings in other general military courts systematically, we cannot state this with certainty, but it does not seem reasonable for the number of older boys brought to the court to drop so significantly. No doubt this is a welcome policy of the military courts, which ought to consistently apply to all boys under the age of 18. However, as long as the age of majority has not been raised in the military legislation, it is still an act of benevolence rather than a legal obligation and therefore it might stop at any moment.